While Britain may have roads in better conditions than in some other nations, it’s no secret that some of the tarmac and concrete surfaces that we drive on each day aren’t what we would call “in good condition”! In general, though, our councils and the Highways Agency do a good job of keeping the majority of our road networks well-maintained and will fill any potholes that get discovered. The thing is, despite ongoing maintenance occurring on most of our road networks, some roads are rather dangerous to drive on in certain conditions. There is no denying that Britain has many scenic routes that anyone with a vehicle can enjoy these days, especially in the middle of summer and on bright days. However, some of those famous roads can also be known as accident blackspots for various reasons. There is a stretch of road on the A537 which is around 7.5 miles long. It is known locally as the “Cat and Fiddle” road, named after a popular local pub of the same name located at the summit of the road. Located between Buxton in Derbyshire and Macclesfield in Cheshire, the Cat and Fiddle road is of a single carriage way and features some stunning views of the Greater Manchester conurbation. The only trouble is, the road features a plethora of snaking corners, and many people have lost control of their vehicles at speed on the A537. Some improvements have helped to make the road safer, such as the installation of motorcycle crash barriers and average speed safety cameras. According to EuroRAP (European Road Assessment Programme), it is no longer at the top spot of Britain’s most dangerous roads because of those improvements. EuroRAP states that 39% of the crashes on that stretch of road involved a motorcycle and 22% of them occurred at junctions. So, what makes the A285 such a dangerous road? Well, the problem is down to the fact that it has quite a lot of bends in the road. As you can imagine, bends and high-speed driving don’t mix too well, and if you add bad weather into the equation, accidents could even become fatalities. The A18 is a stretch of road in Lincolnshire that spans 10 miles from Laceby to Ludborough, near Grimsby. According to figures from the Road Safety Foundation, it’s described as a rural route that is tree-lined, and is also narrow and winding. 44% of the accidents that have occurred on the A18 so far have involved “run-off” crash types; this is where vehicles leave the carriageway and end up in a ditch or private land, for example. During 2012 to 2014, there were 16 fatal or serious crashes on the A18 road. Hardknott Pass is a hill pass that serves as a direct route between Eskdale and the Duddon Valley in Cumbria’s Lake District National Park. With a maximum gradient of 33%, it is one of Britain’s steepest roads. A narrow road with severe bends, the route is virtually impassable during winter and is only suitable for cars and motorcycles and not road transport services. 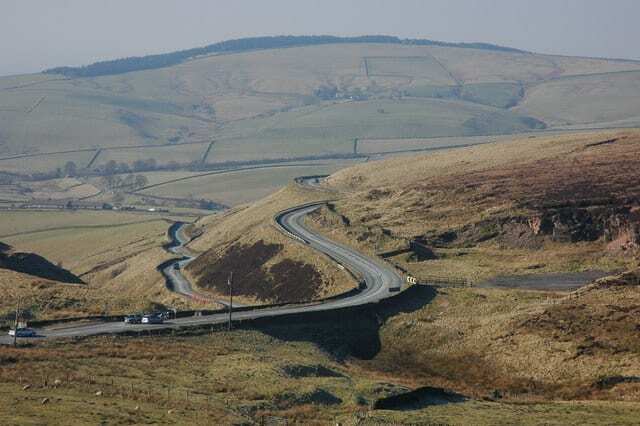 A series of hairpin bends make it rather tough to see the road ahead in places, and so drivers on the Hardknott Pass are urged to be vigilant and drive slowly. According to an article by the Daily Mail, a tourist managed to survive a 500-foot roll down a hill in her car on the Hardknott Pass when one of the vehicle’s tyres blew! A tie with Hardknott Pass is another steep road, the Rosedale Chimney located in the North York Moors national park in Yorkshire. Another route with a 33% gradient, it’s one of England’s most challenging roads, and it’s advised only cars with modern and functioning brakes drive on it! As with Hardknott Pass, drivers should not travel on it during snowy or icy conditions for obvious reasons. There are signs up on the pass warning lorries and caravans to avoid driving on it. 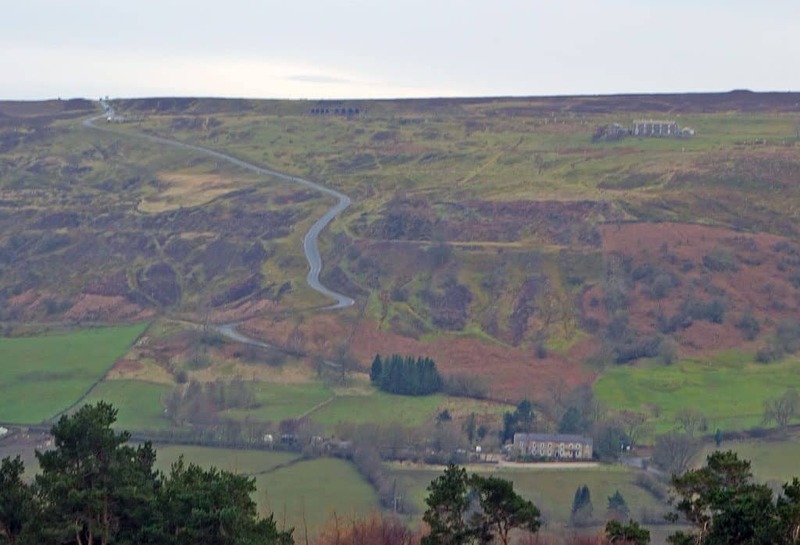 Rosedale Chimney is also a popular route for cyclists who relish the challenge of cycling UP the one-mile long road. The A361 is actually 195 miles long, but the most dangerous part happens to be the route that spans Chipping Norton to Banbury in Oxfordshire. According to EuroRAP, the single carriageway constructed road is a notorious hotspot for accidents. Their statistics state that an unnerving 36% (more than one-third) of all accidents on the A361 between Chipping Norton and Banbury involve pedestrians and cyclists. Bealach na Bà is a hilly road located in the Scotland Highlands. The single carriage route is the third-highest in Scotland, with an elevation of 2,054 feet above sea level. It features a series of hairpin bends, much like what you’d find in the Swiss Alps. It makes the list because it’s so narrow, with many sharp bends and steep gradients. The road to the Applecross peninsula even has signs warning learner drivers, large vehicles, and caravans to avoid driving on it! Over in Northern Ireland, there is the picturesque Antrim Coast Road which is actually a part of the A2. Built by ambitious Victorians and completed in 1842, the Antrim Coast Road is dangerous as it is beautiful. That’s because it got built beneath towering cliff edges, and, as you can imagine, coastal erosion has meant that falling rocks are a common problem there. Since 2013, over £600,000 has been spent on improving the route to make it safer for motorists. In 2015, it was reported that a stretch of the A44 between Llangurig and Aberystwyth in Mid Wales was (and still is) one of the country’s most dangerous roads. During 2011 to 2013, 54% of all accidents on that part of the A44 were run-offs. It’s considered a dangerous route due to the fact that it’s a rural road and often poses hazards usually unseen on motorways or other national roads, for example. Last, but not least, there is the A643 between Brighouse and Morley. EuroRAP recorded that the single carriageway road had 11 fatal or serious accidents during 2012 to 2014. Plus, 36% of all accidents sadly involved pedestrians and motorcycles. Do you know of any dangerous roads near you? Or have you experienced any of the most dangerous roads above? The above is by no means a list of all dangerous roads in the United Kingdom. If you’ve got a notorious one near you that is an accident blackspot, or is only okay to drive on during perfect summer weather, do let us know in the comments section below!